A popular, non-surgical treatment, PRP is an effective and clinically proven pain relief therapy that stimulates the body’s natural healing process using the patient’s own cells. The procedure is performed at Eastbrooke Family Clinic, Burleigh Waters, with the PRP extracted from the patient’s blood and reinjected during the same appointment. 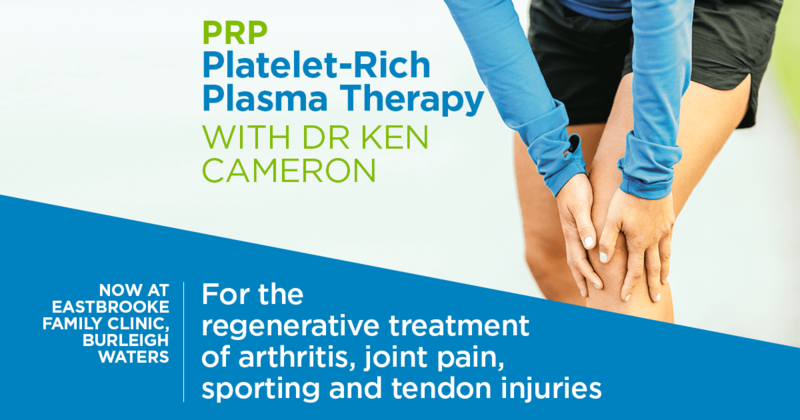 Dr Ken Cameron uses ultrasound imaging guidance for all PRP treatments to ensure the high concentration PRP is accurately injected to the site requiring healing and regeneration. Make an appointment with Dr Ken Cameron at the Eastbrooke Family Clinic, Burleigh Waters, to discuss if PRP therapy is right for you.